LinkedIn headline ideas can be tough to brainstorm and having a LinkedIn profile became vital about 3 or 4 years ago (Wendi Weiner, The Writing Guru quoted in Entrepreneur Magazine). More than 94% of recruiters use LinkedIn to source out job candidates, and there are more than 500 million users on LinkedIn. Just like your resume has only 5 to 7 seconds to capture a readers’ attention, your LinkedIn profile headline must capture a reader in 120 characters of space. A powerful headline on LinkedIn with the right keywords will increase your chances of having recruiters reach out to you. Having a standard job title title (e.g. “software engineer”) rather than a more clever one (e.g. “coding ninja warrior”), makes you 45% more likely to be messaged by a recruiter. However, your headline should be more than just your job title. Why? Telling the reader that you are the Vice President of Simpson Corporation does not tell the reader at a quick glance the industry you are in, what department you lead, or your other core areas of focus. What is your unique value to your clients and company? What are your 3 top skills or core areas of focus? Attorneys: Consider listing the areas of practice and some key skills as well such as corporate governance, compliance, or litigation management. These are often found in job search terms as well. Sales and Marketing: If you are a leader, manager, or executive, say so. Consider including areas of focus that include marketing, revenue growth, business development, client relationship management, stakeholder and partnership management. Finance and Accounting: Depending on your level, consider the types of clients you serve, and the work you are doing. Typical keywords can include client relationship management, financial advisory and planning, investment strategies, wealth management, and cash flow analysis. Information Technology and High-Tech: Most IT and high-tech professionals will either be on the front-end or back-end of the work, but some will have a mixture of skills. If you have a mixture, let others know that you have hybrid skills that pivot both areas. Consider focusing on things like infrastructure management, enterprise architecture, troubleshooting and support, and innovative ones such as artificial intelligence and machine learning. In the last few years, I have worked with an extensive number of clients who have sought to make the transition into machine learning strategy roles. If you are looking to break into a new sector of an industry such as artificial intelligence or machine learning, consider signing up for continuing education programs. There are many that function as mini-MBAs or advanced certifications in a specific area. These are great resume boosters. Including a compelling statement in your LinkedIn headline can increase your profile views, expand your connections, and generate more leads whether you are a sales professional or a job seeker. If you are seeking a new role, you can also consider letting readers of your profile know that you are seeking new opportunities. It is not just an “open to new opportunities” or “currently job searching” as keywords in the job title. Consider if you are a sales and marketing professional, you can add something at the end of your LinkedIn headline that says, “I can transform your top revenue numbers.” Do not forget to include your email address so that recruiters and hiring managers can reach out to you directly. In the beginning years of my writing business, The Writing Guru, I focused mostly on resume writing and my LinkedIn headline captured that. However, when I began to grow my publication base and writing portfolio, it seemed more important to focus on certain aspects of my brand rather than just the resume writing as I was much more than a resume writer. The same theory goes for any job seeker, entrepreneur, or business professional. As you evolve in your business or career, your LinkedIn headline will as well. It should not remain static or stagnant. Instead, it should be something that constantly evolves as you grow and evolve professionally. Just keep in mind that your LinkedIn headline should align with your resume to emphasize the value that you bring to your industry and the outside work. Be creative, compelling, and impactful. Remember that your LinkedIn profile is more compelling than your resume and it should be written in first-person. 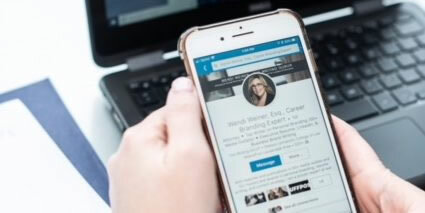 Interested in having Wendi Weiner, The Writing Guru review your LinkedIn profile or getting a full LinkedIn makeover? Book a consult call with Wendi Weiner here.